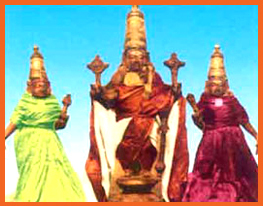 The Perumal in this sthalam is Thirukkaar vaanar. Kaar means clouds and Neer means rain (or) water. The God explains to the world that the water in this world is the resemblence of him and the Kaar (the black clouds which gives rain) to the world is also one of his reflection and clouds which is found in the sky is also the reflection. Without water, the World cannot survive. So, he comes to the World as rain and make all the things to survive. So, Sriman Narayanan explains that he himself is the black clouds which gives the rain for the humans and all things to survive. So, this perumal is called as "Thirukkaar Vaanakkalvar. Theertham - Gowri Thadaakam ( Tharaadara Theertham). The Perumal found here is Kalvar and he is found in Standing position facing West direction. Prathayaksham for Gowri Parvathi Devi. This Divyadesam is also found inside the Pragharam of Ooragathan Temple, Kanchipuram.